Ages 4 through 10 . 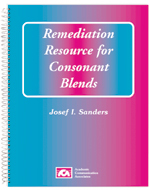 This book includes reproducible pictures, games, and thinking activities that can be used to teach consonant blends to students with disorders affecting speech sound production. All of the worksheets may be reproduced. The activities can be used to stimulate correct production of blends containing /l/, /r/, and /s/. Activities for each of these three blends are divided into two sections. The first section includes picture worksheets in which words are depicted that contain the blend. Students should be asked to name each picture and/or to use each word in a sentence. The second section includes a variety of games and thinking activities for the target blend. The worksheet activities can be used in the school or clinic environment to strengthen both listening skills and correct production of consonant blends. The activities can also be used for home practice.